Meridian was contracted by the Government of the Virgin Islands through the BVI Ports Authority to undertake the marine construction and dredging for the Cruise Pier Expansion project. 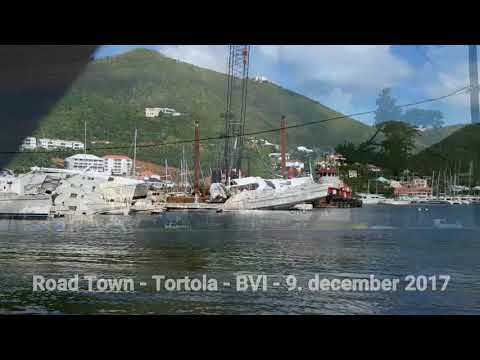 Meridian Construction Ltd was engaged to undertake the dry salvage of the 30-tonne Sunreef 62, Catsy, which had been flipped upside down during the passage of Hurricane Irma on September 6, 2017. This complicated project, where the priority was to minimize further damage, needed three cranes, and an excavator. A team comprised of Meridian, Commercial Dive Services, and B&G Lifting, undertook the 10-hour project with six hours of prep work and four hours of lifting, moving, and flipping this yacht. Installation of Sewage Treatment Pump Station. Meridian was contracted by Biwater International to construct the pump station and install the pumps. This work was technically difficult as the pump station, located at a depth of 25’, is situated on reclaimed land and below the water table. Additionally the subsurface is running, waterlogged sand. This meant that no ordinary excavation could be conducted and required Meridian to devise a method to construct and install these 15-ft diameter, reinforced concrete tanks.